The ARS-5 and ARS-5-H Multi-Stage Voltage Regulator is living proof that intelligent regulation doesn't require a rocket scientist to reap its benefits. The ARS-5 features the latest multi-stage control for multiple battery types, along with an easy, basic method of programming. 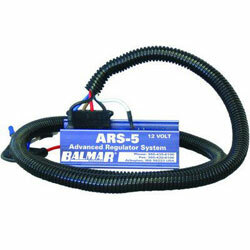 The Balmar ARS-5-H includes a 54" wiring harness. Programming is as easy as selecting your battery type and belt width. Four battery types are supported; Gel, AGM, Std. Flooded, and Deep Cycle Flooded. Once the appropriate battery type is selected, the regulator enables you to select the proper power limits, based on alternator output and belt width. Once those two modes are set, the regulator is ready to provide optimal charging control for your batteries. Alternator and Battery Temperature Sensing (with optional sensors MC-TS-A and MC-TS-B) sense battery temperature and automatically adjust charging voltage to optimize charging. This is particularly important for sealed batteries, such as Gels and AGMs, which are sensitive to voltage and heat.